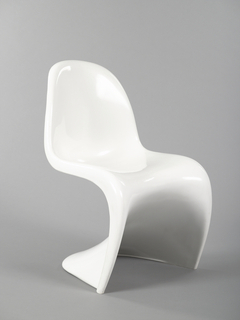 See more objects with the tag interior, home, seating, offices, chairs, curved, cut-out, fluid lines, curved back. See more objects with the color brown silver chocolate or see all the colors for this object. This is a Armchair. It is dated 1957–65 and we acquired it in 2011. Its medium is fiberglass-reinforced plastic, plywood, chromed steel, upholstery, latex foam. It is a part of the Product Design and Decorative Arts department. Finnish-American architect and designer, Eero Saarinen, son of Finnish architect Eliel Saarinen and sculptor Loja Gesellius, is a major figure in modern design. He is best known for a number of American landmarks, including the highly sculptural TWA terminal building at New York’s John F. Kennedy Airport (1956–62) and the soaring, stainless steel Gateway Arch in St. Louis, Missouri (1963–65). Like several of his contemporaries, he also undertook furniture design, which presented unique technical and aesthetic challenges, particularly in the category of seating. Saarinen’s furniture designs of the 1940s and 50s were benchmarks for postwar innovations in form, function, material, and production techniques. Saarinen was interested in exploring the structural and aesthetic possibilities of molded plywood. In 1941, he collaborated with designer Charles Eames to create the Organic chair as part of their winning entry in MoMA’s “Organic Design in Home Furnishings” competition. Saarinen’s progressive ideas were inspired by his interest in organic forms and the possible uses of wood laminates and plastics in both domestic and corporate settings. His work on the Organic chair provided a basis for his highly successful furniture designs for Knoll. The Knoll furniture firm was founded in New York in 1938 by Hans G. Knoll who, in 1943, hired Saarinen’s family friend, the young architect Florence Schust. The dynamic Schust quickly became a partner in the business, which was renamed Knoll Associates. In 1946, she and Knoll married. The Knolls were interested in developing new and modern products by working with well-known designers. Saarinen, who began working for Knoll in 1943, was among this group. His early designs included the 1946 bentwood Grasshopper chair, and the molded fiberglass and foam-covered Womb chair; examples of both are in the museum’s collection. The Model 71 armchair is composed of an upholstered, foam-covered molded back/arm unit and seat mounted on chromed tubular steel legs. The chair was a component of one of Knoll’s first office seating programs, intended to be part of a unified interior in the workplace. The armchair design was one of several iterations of the model, which included an executive chair and a secretary’s swivel chair and was part of Saarinen’s interior furnishings scheme for his General Motors Technical Center in Warren, Michigan (1949–56). 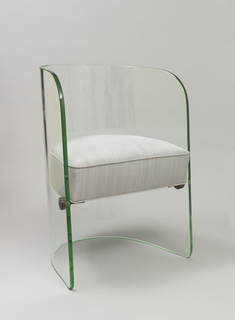 The chair has since become a staple of modern design and is still in production today. 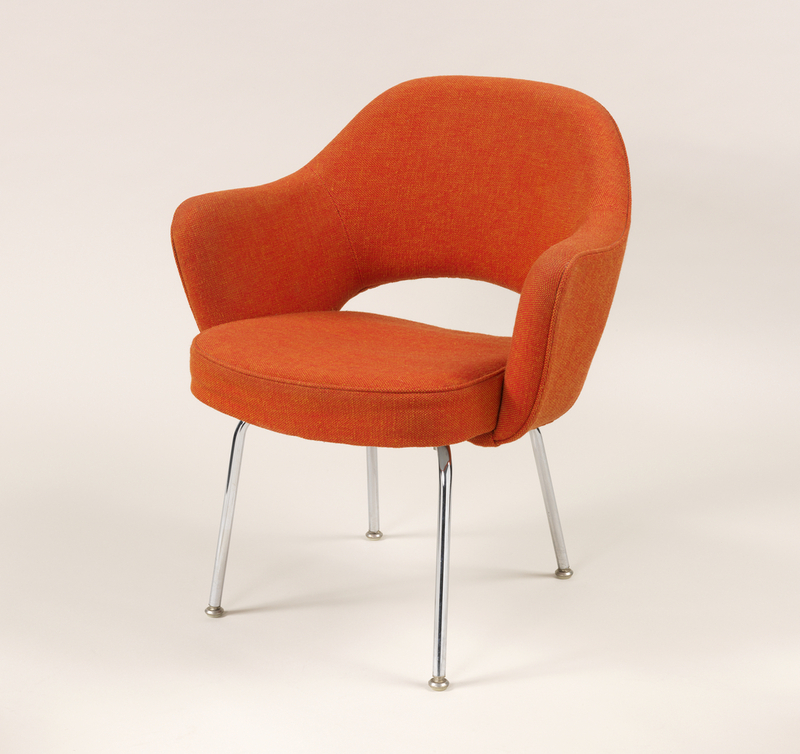 The example under consideration is in extremely good condition and retains its original bright orange and yellow Knoll upholstery. 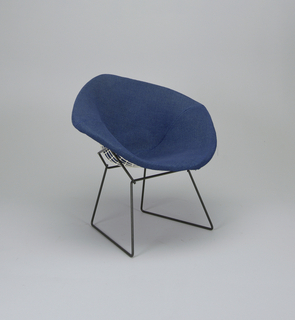 Given Saarinen’s importance to mid-20th-century design, and the significance of Knoll textiles in the museum’s collection, this chair would be a welcome addition to the museum’s collection of Saarinen furniture.